Today is January 8th and I am taking part in #DITL: Day in the Life of a Teacher. This is the 7th post in the series. I am posting on the 8th of each month. Today happens to be a Sunday. Today actually starts with yesterday. We were supposed to head into Boston, MA with my church's youth group, but snow was predicted. I had to make the call to go in, postpone, or cancel. I hate making weather related decisions, but when they start using the word "blizzard", I guess it is time to cancel/postpone. We were to head into Fanueil Hall and park. 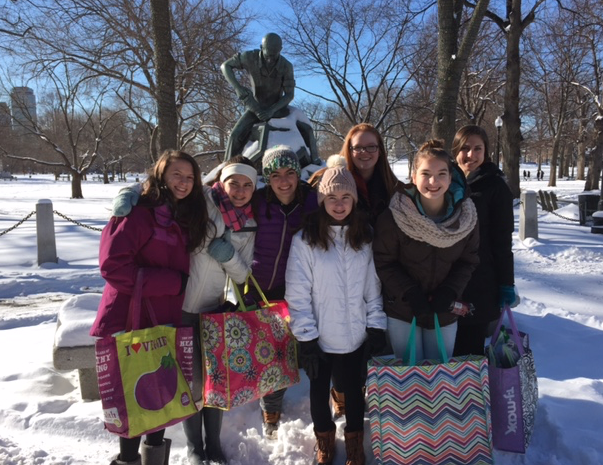 Walk to Boston Common to hand out Blessing Bags. These are gallon ziplock bags with 2 peanut butter and jelly sandwiches, 2 homemade chocolate chip cookies, a bag of chips, 2 of a combo of hat/socks/mittens, and a prayer. It is a great culmination of efforts by our church community. We had a hat/sock/mitten drive for our church community. Then, our Middle School youth group got together on Friday, 38 kids!, and made 130 PBJ sandwiches. I baked 150 cookies. 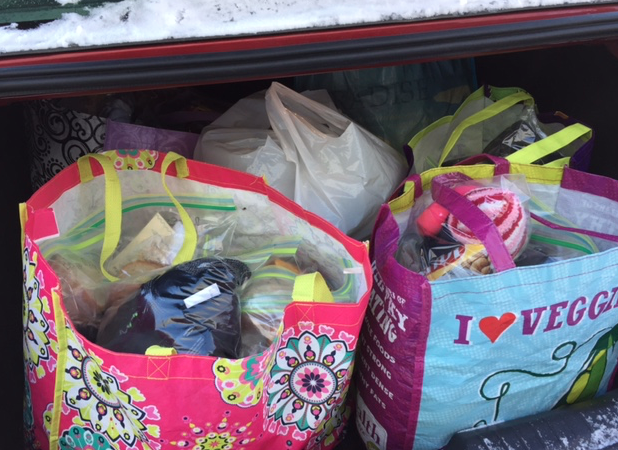 The MS youth group bagged everything up and we have 90 Blessing Bags to bring into Boston. And, with a blizzard, they would really be needed however. The drive wouldn't be safe and hopefully the homeless people would make their way to shelters. We were going to hand out the bags, walk back to a new ice skating rink at City Plaza and go skating, then get dinner at Quincy Market. We were going to be gone from 12:30 - 7:30, so with postponing it, I "found" 7 hours! I do love when that happens. I watched Gilmore Girls, knit, and wrote up two versions of a logarithm quiz - a great snowed in Saturday. That leads me to today. The Blessing Bags were stored in one of the rooms where CCD was to be held this morning, so I had to get up early to get them. I woke at 7 am, got dressed for the gym, cleaned 8 inches of light snow off my car and headed to the church to grab so many great blessing bags. 8 am head to the gym for my boxing class. The parking lot was almost empty and we only had 5 people in class. That meant a lot of punches got in, my knuckles were hurting. I told the instructor the class was quieter than our math team practices, LOL. Home by 10 am. If we went to service and skating yesterday, we were going to bring 10 adults and 20 kids. I postponed it to today because I didn't want all the food and hard work to go to waste. We will be bringing 6 adults and 7 youth and will skip the skating part. We will be on a mission to deliver 90 Blessing Bags. We will head out at 11. I came home from the gym and sent them a reminder email and told them to dress warmly, stating that four layers of clothes is not too much and don't forget your toes. That was the first thing that got cold when I was out this morning. Say "Good Morning" to my sons who are just waking for the day. My husband is at his mother's house cleaning her out. Take out pork chops for dinner tonight. My #3 and 4 sons have indoor golf league from 12-2, so I make sure they are all set for that. Find out it is canceled due to snow. Send an email to my colleague with the 2 versions of the log quizzes. Sit down and blog for a few minutes. Get my layers on and head into Boston. 11:00 meet up with 6 adults and 7 kids at the church, head out at 11:30, get into Boston Common by 12:30. There were a ton of people out on the common, mostly taking pictures of all the snow. Lots of dogs running loose, little kids sledding down the hills. It was so pretty and so alive. We started walking around and didn't see too many homeless people so we crossed the street and saw some by the Dunkin Donuts and their friends staying warm in the T(subway) station came out to meet us. We walked around a few block and met several people to give our bags to. They were very grateful. We were getting cold, so we ducked into Sal's pizza and all grabbed a quick lunch and warmed up, then back at it. We walked a few more blocks. One person asked for toothpaste, so I will make notes to bring that next year. 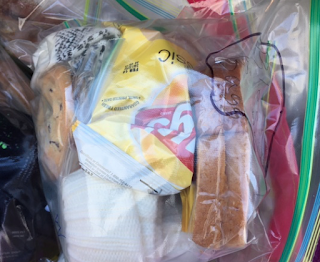 We ended up at a shelter and lots of people greeted us and we were able to give away all we had. Back to the car and back home. A job well done. The youth were great and it feels really good to help people. 3:00 home and grab son #3, my senior to make him do some math. Now it is time to get ready for my week ahead. I will boil a dozen eggs because I bring 2 a day for part of my lunch. I will make tuna so I can bring that this week. (My mom always says I am too predictable. I think I am just prepared.) I need to figure out my meals for the week, take inventory of my food and write my grocery list because I will go shopping tomorrow. Then, it will be time to make dinner before son #4 has CCD at 5. They are having a parent meeting, so I will go to that brief meeting, come home eat dinner, and then join him for mass at 6:30 pm. I usually go to 5 pm mass on Saturday but when he has CCD we go to mass on Sunday night. It is a nice way to end the weekend and get ready for the week ahead. 6:30 pm mass - I do enjoy it. I try to be present and still and this leads to clarity. Then, a clear brain leads to math ideas popping in my head like loud popcorn, pop, pop, pop. It becomes a to do list I must write as soon as I get in the car. I try to focus on mass. Email a teacher friend about a mystery that might happen Thursday in class. Can't mention it here yet, but will blog about it after it happens. Grade 2 Alg 2 ebook problems that were handed in late. 7:30 pm and my day is done. Time to read and go to bed.